​Sully Morland (line 7) 2 minutes walking distance. A white tiled bathroom offers a bahtub & shower fixture, a wash basin, lit mirror, toiletries , towel warmer & WC. The high windows at East West exposure permit light all day. 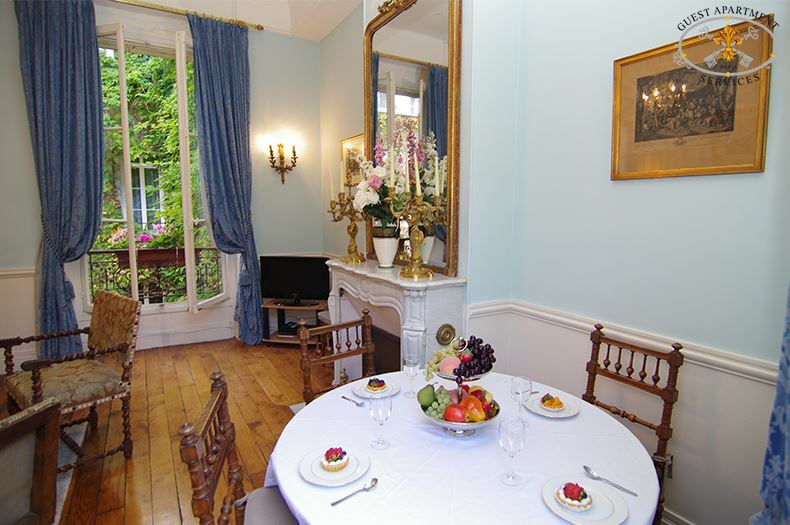 The discreet Ile Saint Louis is one of the most enchanting places to stay. 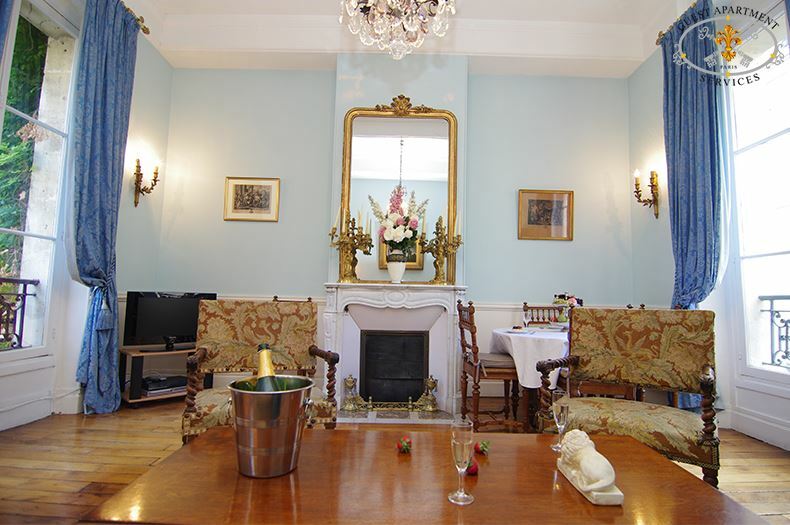 It is delightfully unspoiled and has a mixture of handsome 17th century architecture, modern boutiques, narrow streets and magnificent views from its tree-lined quays. Many of the houses on this prime piece of real estate, occupied until 16th century, were built for the noble families on the quays called before 'Ile aux Vaches' (Island of cows). Running lengthways along the island is the main street, Rue Saint Louis en l'Ile. 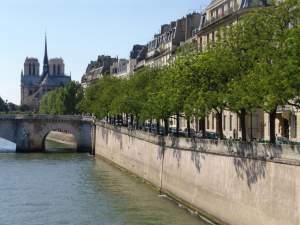 It boasts a Baroque church, refined boutiques, old-fashioned bistros and brasseries, delicate chocolate and food shops, a florist, boulangeries, Berthillon ice creams, a wonderful cheese shop, many pretty tea parlors, art galleries, restaurants … All the main attractions are close to the island as well: Pompidou Centre, the Louvre Museum, Jardin des Tuileries, the Sainte-Chapelle and the Latin Quarter is easy walking distance. 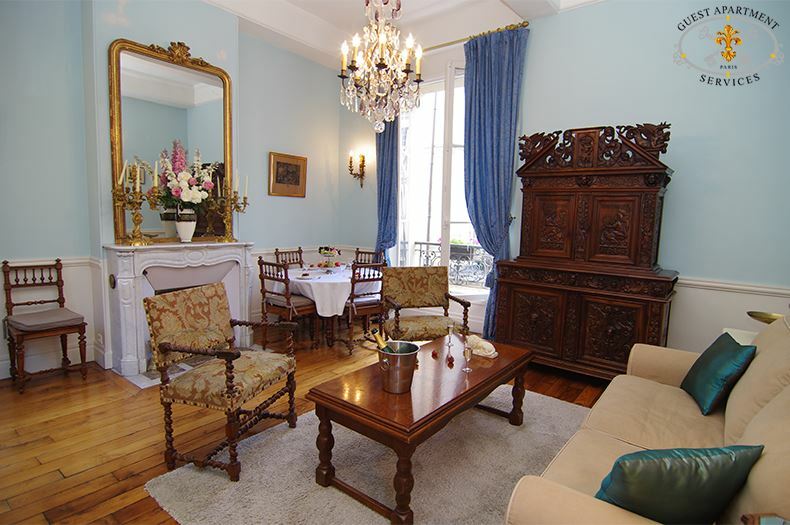 This tasteful large one bedroom apartment is situated in a prestigious 17th century historical Noble Townhouse of the Ile Saint Louis. 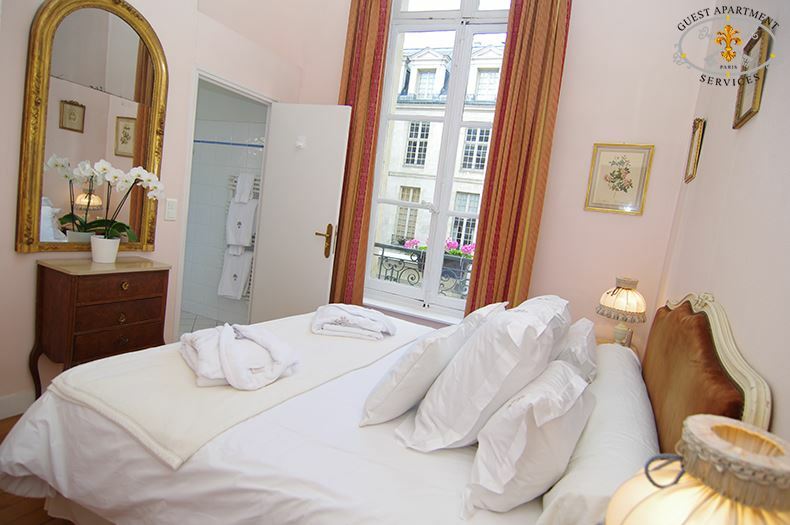 Located in one the more quiet streets of the small Isle Saint Louis. East West exposure enables all the rooms to benefit from the abundant natural light. A refined combination of charm of "Le Grand Siècle" with the comfort and convenience of today. A long ligth-filled corridor with wooden restored parquet floor gives access to all the rooms of the apartment. Delicate crystal chandelier and two bronze sconces adorn the foyer. 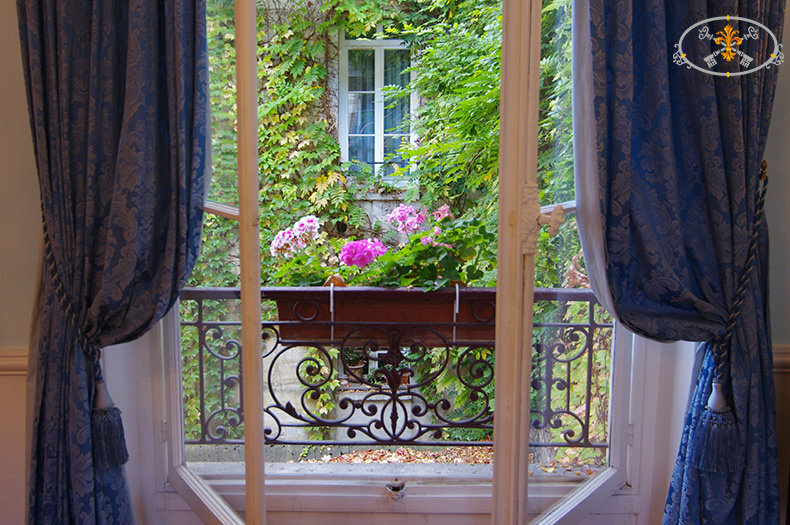 The two large French windows offer views of the private courtyard of the building. 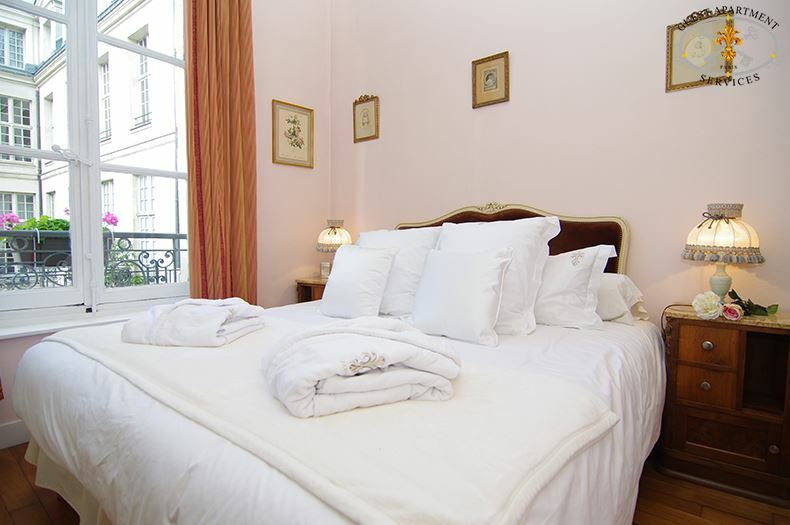 The separate calm and quiet bedroom has walls painted in delicate soft pink color with parquet floors. A King size bed (convertible in twin beds), two bedside tables and reading lamps, a small white painted "coiffeuse", an antique crystal chandelier from the 19th century to add to the cozy ambiance of the room. Closing chintz curtains with black out lining permit to have the room totally dark at night. 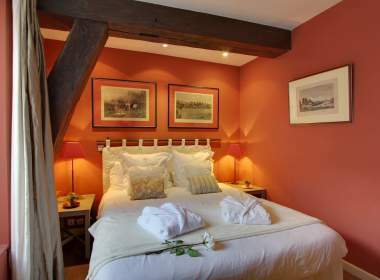 Several framed engravings form the 17th century adorn the walls. 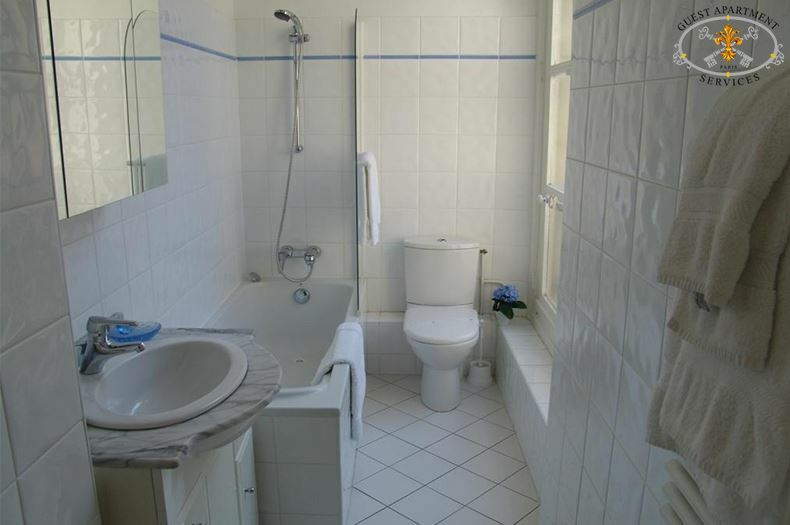 The adjoining bathroom is tiled in white and blue. It is equipped with bathtub and shower fixture, with glass splash protection, wash basin, lit mirror, toiletries cabinet, closets, WC, and towel warmer. Hair dryer available. In the long corridor, a small place has been created for a working place where there is an antique desk. 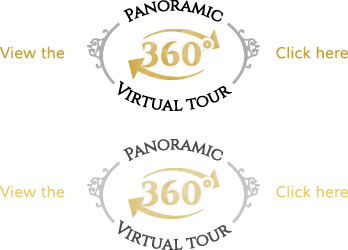 A 19th century large armoire is also in the hallway and is good for storing your personal things as luggage. 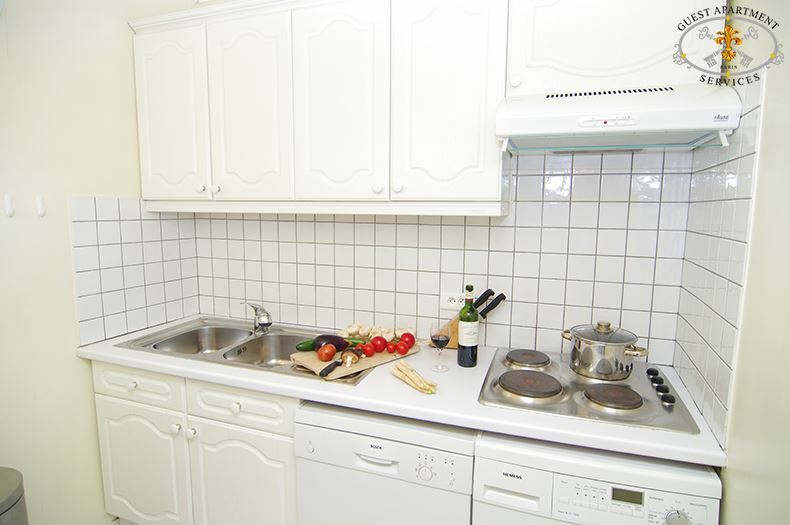 The separate kitchen provides all modern amenities. Several cupboards hide all cutlery and dishes and glass ware. 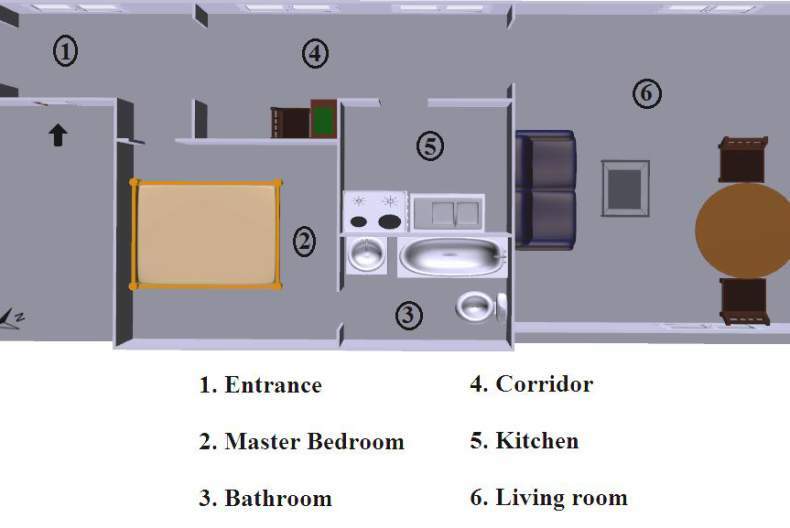 All the main electrical items are present : large fridge and separate freezer, a dishwasher, a washer/dryer combination unit, electrical and gas burners, a separate up date oven and microwave unit, toaster, electric kettle, coffee maker… Iron and iron board are also present. 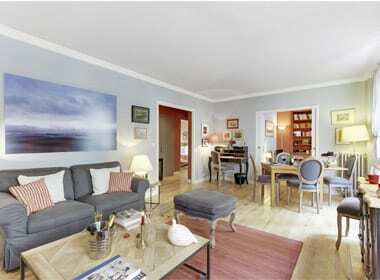 The most impressive room of your apartment is the large living room of 28 square meters. High ceiling, renovated wooden parquet floor and large high windows on both sides of the room offering a view on the street on one side and of the courtyard on the other side. It is arranged to create different areas and ambiances combining dining room and living room. Each window is draped with delightful damasked heavy blue pastel curtains and tie backs on both sides. The elegant marble fireplace (not working) surmounted by an antique 19th century gilded mirror, antique candelabras and a rare bronze clock ("carillon") from 19th century. Other delightful pieces of furniture complete the 19th century atmosphere. The dining area is composed of an antique table and four antique chairs. The living room area has a large white colored couch (convertible in double bed) with a French style carpet and coffee table with two Louis XVI armchairs. There is also an impressive Buffet from Renaissance era. The final touch comes from framed paintings and 18th century prints. 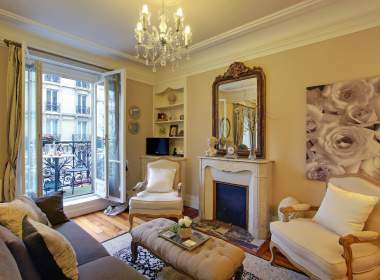 To complete this elegant Paris apartment, many other modern convenience are for your disposal : A colored TV with cable offering the main international channels such as CNN, BBC… , A new DVD player Zone 2, a hi-fi stereo with CD-player, Private phone line with answering machine . A strong box for your valuable is available.